1. A old version of the F clef that locates f (below middle C) on the third line. Also [Eng.] F clef; [Fr.] clef de fa (f); [Ger.] F-Schlüssel (m); [It.] chiave di basso (f); [Sp.] clave de fa (f). 2. 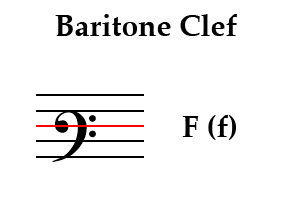 There is also a rarely used baritone clef in the C clef. This clef puts middle C on the top line of the staff. This creates the same placement of notes as the baritone clef in the F clef. So both baritone clefs are essentially the same notation using different clefs.